The “Bare” has been a huge success in 2006. Although it is a little harder to apply than the standard Easyboot Epic, the Bare provides a simple, close-fitting boot that constantly adjusts to the hoof. The boot is designed to stretch and flex, mimicking the movements of the naturally bare hoof. 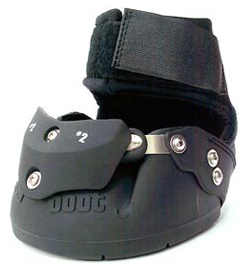 Check out the 2007 model with the lower profile comfort strap, thicker bungee and improved rivets. Rising to the challenge, the Bare was used in 2006 by two horse and rider teams to successfully complete the 400KM Shazada endurance event in Australia. In addition, it has successfully completed several 100−mile and 250−mile endurance events in extreme conditions on barefoot horses. Not only did the Bare boots stay in place, they did not rub, twist or turn. The results are even more impressive considering many of the test miles were completed in deep, boot-sucking mud and snow. The Easyboot Bare is designed to stretch and flex, mimicking the movements of the naturally bare hoof. And check out our new gaiters that fold down to make application easier! These hoof boots have a simple, form-fitting design with few moving parts. The boot stretches and flexes to mimic the natural bare foot. After the bungee is adjusted, daily adjustments and tinkering are not necessary. All parts are replaceable by the consumer. The sole of these protective horse boots is patterned after the barefoot horse. It flexes and gives very much like the bare hoof. Available in sizes 00 through size 3. Free shipping on Easyboot Bares for a limited time!